This simple and quick afghan is part of my Decorating Your Home with Crochet series!!! Touch of Teal Afghan is my first project made exclusively for this series to decorate my new home… Teal, beige and white are the color scheme for my new bedroom… Stay tuned for more crochet decor in this room.. Of course~ I do have some previously made doilies made by myself and my grandmother(Beatrice Ryan Ramshaw) decorating this room… When the room is done, I will post a full story along with the pictures of everything crochet in this room!!! 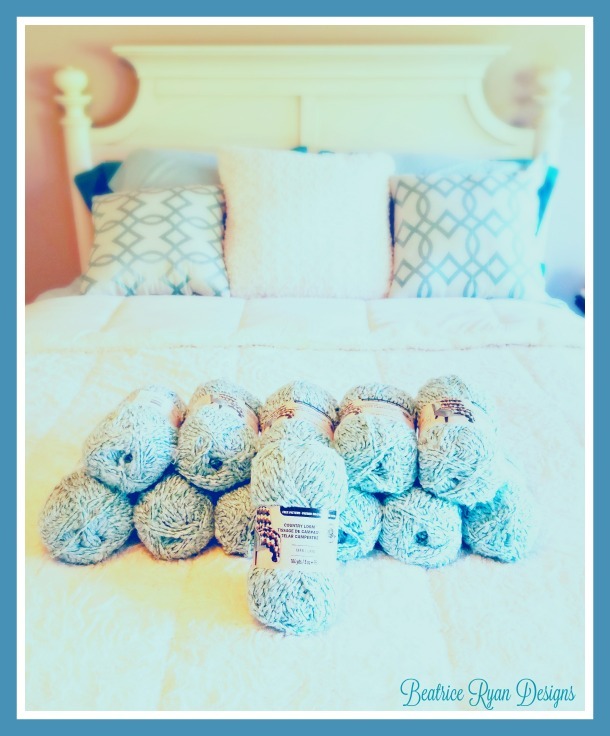 Now to the Touch of Teal Afghan… This is a super easy crochet pattern using only front loop single crochet and back loop double crochet to create the base… The edging is a simple shell pattern. Using a super bulky yarn, this really goes quickly!!! Let’s get started decorating our homes!!!! Yarn: 1050 yards of super bulky(size 6) yarn. In this pattern I used Michael’s Loops and Threads Country Loom Yarn in Clear Skies. It took 10 skeins.. But, one reason I love Michael’s.. They have great yarn pricing and coupons!!!! 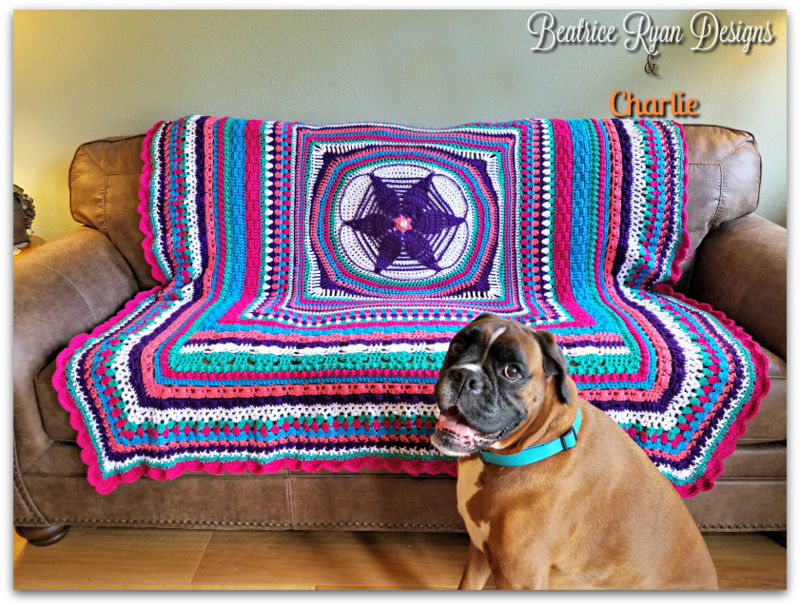 105″ x 40″ ** This design is very stretchy so the afghan will be able to cover a much larger area. Even rows are the right side. Rows 4-59: Repeat rows 2 & 3. *Working on the wrong side, turn your project so you will be working down the side of the rows. Join yarn on opposite end with wrong side facing at the top right edge. Congratulations!!! You now have a Touch of Teal Afghan!! 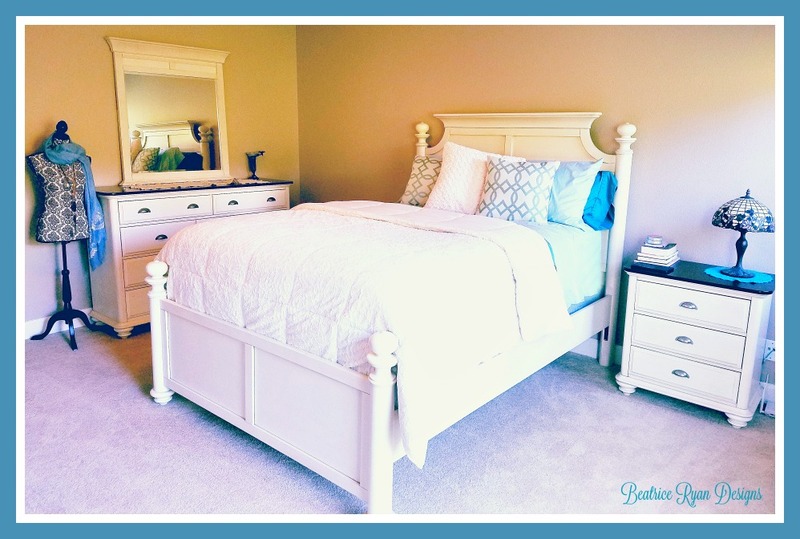 Please make sure to share your finished projects on my Beatrice Ryan Designs Facebook Page... I love to see your work!!!! I am so excited to present you with my latest Weekly Post Series!!! Recently I have moved into a new Condo and have had so much fun decorating!! I thought it would be really fun to show you my new home and how I decorate with my crochet!! It is a work in progress and you will get to join me in my fun! Each week I will post a picture of an area in my new home that I have either decorated with previous crochet projects and talk about where the crochet project came from, what pattern was used and how you too can use your handmade crochet projects in your home!… Also, I will share Free Patterns that I will be making to decorate my home with, you will be able to make it right along with me! These projects will be CAL’s, finished or new free patterns or taking a finished project and turning it into a whole new home decor item!!! 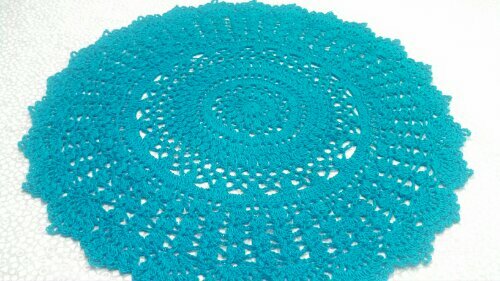 I hope to inspire you and show you what you can do with the most popular fiber arts craft in America ~ Crochet! This is a free pattern by Denise Owes and it is called Summer Splendor! To kick off this new, fun journey… I have decided to make a super simple, chunky, colorful afghan! This weekend when I was doing a little shopping therapy, I found my self in Michael’s! 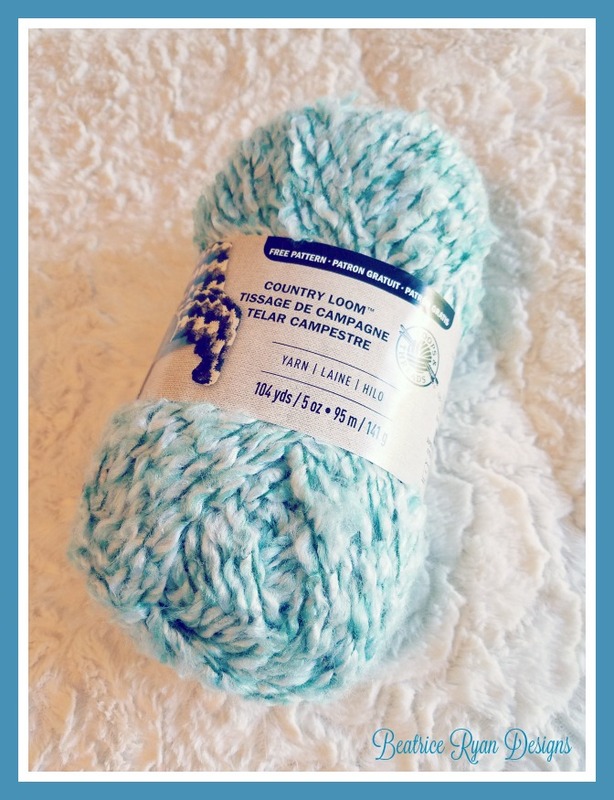 Their Loops & Threads ~ Country Loom Yarn was on sale and exactly what I was looking for… I chose the color ~ Clear Skies! This fabulous yarn is a #6, Super Bulky Acrylic Yarn, and a N Hook is recommended. Each Skein is 104 yards. I purchased 12 skeins for a total of just over 1200 yards. 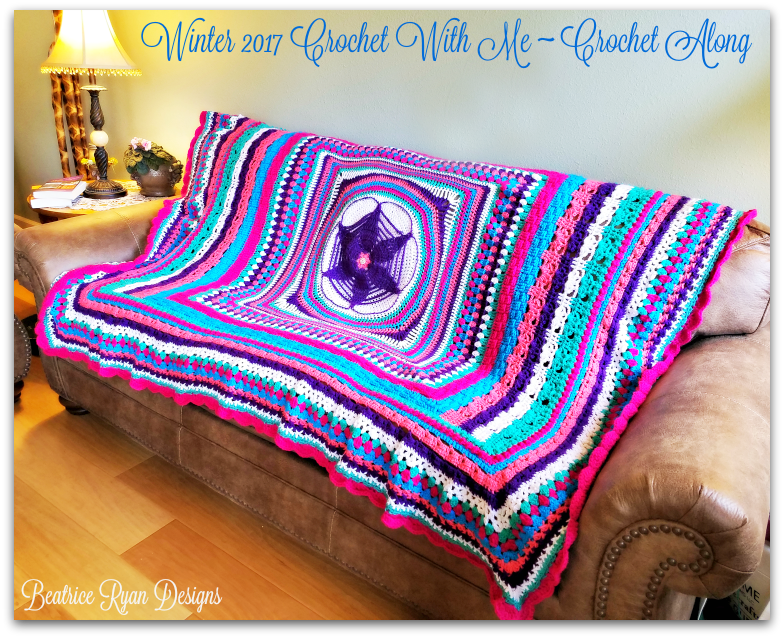 Next week, I will post a finished picture of the afghan and the Free Crochet Pattern… Along with some other decorations adorning the room! 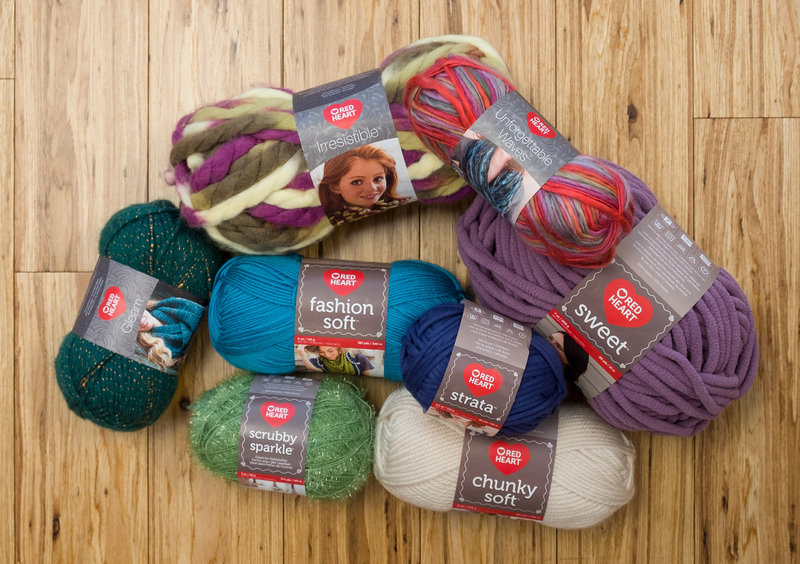 Grab your coupons and get your yarn ready to start this fun project next week!! Tune in weekly for more beautiful crochet, decorating ideas and inspiration!